Ice Fishing Report March 1, 2014 Jeff Sundin - "Weekend Outlook - Hot Action Trumps Cold Weather" - I KNOW! Another icy weekend to live through. But at least the fish can't tell and they're ready to help bring us into March with a smile. The way I look at it, it's a little bit late to complain about the cold weather, we've already lived through the worst of it. Even now, the cold snaps are less severe and shorter lived than they were a month ago and when the sun shines, it's feeling a lot warmer, even on cold days. I've mentioned this before, but in case you missed it; One peculiar side benefit of this cold weather has been the amazing stability of ice and fishing conditions. During a typical winter, we would be talking about detours cased by ice ridges. This year, the ice is uniform and travel conditions have mostly been good. That is if you have the right mode of transportation. Another thing that we'd be talking about by now are the ups and downs in the fishing action. Not this year though, for the most part, we've enjoyed very good fishing. In fact, in some places, it's amazing that the fish have been so cooperative. For weekend ice fishermen who want to drive trucks to your fishing holes, Bowstring Lake access is good and so is the West side of Lake Winnie. For ice fishermen with snowmobiles, we probably have the best travel conditions that I've seen in the past ten years. Snow cover is deep, but hard packed. Slush is minimal and except for areas that have been fished heavily, snowmobiles can go almost anywhere they want. Don't Forget! Fishing Licenses Expired Yesterday! Fishing licenses for 2014 now and are available from DNR license agents, online and by telephone at 888-665-4236. All 2014 fishing licenses become effective Saturday, March 1, 2014. Customers who purchase online via smartphone won’t receive a conventional paper license. Instead, they’ll receive a text message or email that serves as proof of a valid fish or game license to state conservation officers. 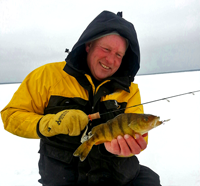 Ice Fishing Report February 26, 2014 Jeff Sundin - "On Lake Winnie - Perch Action + Good Travel Conditions = Best Kept Secret In Town!" - Ever since last Friday's storm ruined eveyone's weeked plans, ice fishermen sort of disappeared from the lakes for a while. That's okay, I understand, but for me it's hard to learn from others, when there's nobody there. So struggling to learn more about post storm travel conditions on the West side of Lake Winnibigoshish, I had no choice on Tuesday except to get in the truck and drive over. Braced for crummy conditions, I had on my tall boots, extra coats, extra hats, even a spare pair of mittiens. But I didn't need any of it. No, instead of fighting slush and huge snow drifts, we drove several miles along Winnie's western shore on a smooth, perfectly plowed road. I hadn't allowed myself any time to fish, but I wish that I would have because we did talk with some ice fishermen out there and they reported that the Perch action has been good. Afterward, we stopped at McArdles Resort for a chat with Craig Brown. Brown explained the sharp contrast between fantastic ice conditions on the west side of the lake -vs- the slush and deep snow on the southeastern shorline; "The northwest wind blew the storm through our area with so much force that the wind literally moved most of the snow away from our side of the lake. Instead, it's all piled up on the south and east sides of the lake". He is right about that. Travel on the west side is very good and the roads, maintained as a team effort with Becker's Resort, provide access to miles of productive structure. Perch fishing action is good according to Brown, giving it a two thumbs up rating. Since there wasn't time to prove it for ourselves yesterday, we scheduled an emergency "ON-ICE Meeting" for today. With a little luck, I'll have a solid productivity report for you by tomorrow morning, just in time to help make your plans for the weekend. For today, you can get more information about lake access and winter lodging on Winnibigosh by calling: Craig & Paige Brown, McArdle's Resort 218-665-2212 or Doug & Nancy, Becker's Resort 218-665-2268 . 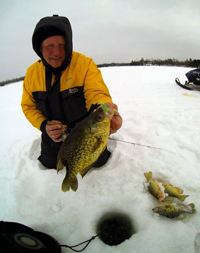 Ice Fishing Report February 25, 2014 Jeff Sundin - "On Lake Winnie - Slush Going In = Slush Going Out" - Northern Minnesota's ice fishing season is poised to end the same way that it began, slushy. After two days of pushing, plowing and digging, rental operators have gained some ground, but still have not reclaimed all of their original territory. What's slowing them down now is the fresh water flowing under the deep snow. Areas where fishing was the best before the storm, are now the sloppiest spots on the lake. In particular, high traffic spots that were near the plowed roads. After receiving an email inquiry about Lake Winnie's travel conditions, I went straight to my best source of first hand information on the big pond. (2/25) On Lake Winnibigoshish, Ryan Peterson said; "It's a lucky thing that this storm didn't hit us a few weeks ago. We are digging out, but there's lots of water right now and at the moment, it's a real mess! Travelling the roads to retrieve fishing shelters has been tough, but we are getting through. The area on either side of the roads are wet, and the fresh blanket of snow will prohibit off road travel by truck or ATV." >> Ryan Peterson's Guiding . (2/25) Leech Lake Area Lakes, Gary Roerick Says; "'Pout Passing and ‘Eyes Ending - Wonderful, wild, and windy, would be just 3 adjectives that you could use to describe this past weekend at the 35th Annual International Eelpout Festival in Walker MN! Congratulations to all who were able to catch the elusive eelpout and to the lucky winners of the many prizes and trophies that were distributed in the Walker City Park on Sunday February 23rd at the awards ceremony! Please check out the Walker Pilot Independent this week to see all of the official results and to check on the total tonnage that was harvested during the Passing of the ‘Pout! The ice thickness won’t slow down if this current weather pattern holds on. I see that we are going to have temperatures in the negative column during each day of this week and into next week. Much of the ice on Walker Bay of Leech Lake and on many of the other area lakes is now in the 30” to 36” range. I have owned extensions for my ice augers for many years and for the first time ever, I had to use my ice auger with an extension to be able to drill new fishing holes in my sleeper fish houses this past week. Enough Ice and Cold, someone can turn the heat back up now! The season for catching walleye, bass, or northern pike through the ice has passed. Spearing of northern pike and rough fish through the ice finished as well. Consult the Minnesota Fishing Regulations booklet for all of the official rules and dates. The good news, we can still fish crappies, perch, and bluegills as that season is open year round. I was able to move several of my sleeper houses to a variety of locations that we are now catching pan fish at. If you would like to join us for some late season ice fishing action or to see some of the latest photos taken, then check out our website at http://roericks.webs.com or give me a call at 218-760-8266 and I will put you on fish! Take a look at my report next week and I will share a short summary of some of the harvest results from our Eelpout festival of this past week. You can also watch for the latest updated information about the dates for ice house removal from the lakes in our area. It is time to check out your favorite pan fish or jumbo perch fishing spots, or give me a call and I will help you with your quest for some fresh fish for your next dining experience!" - Gary Roerick Roerick Fish House Rentals 218-224-2836 . (2/25) National Media Snubs Fishing? I read a post on facebook yesterday that made me think about something. The post by Nancy Koep said; "The National News is making me a little upset this morning! All sorts of coverage and video clips of the Daytona 500 with Earnhardt winning. But what about all the guys that fished the 2014 Bassmaster Classic? All the fisherman showed great sportsmanship and professionalism, yet get nothing?" That reminded me about some friends of mine. They are advertisers on this page so you see them a lot, but in case you didn't know; When it comes to fishing, the guys at Wired2fish ARE the national media and when there's something that you want to know about Bass Fishing, they will have it! Like this coverage of >> the 2014 Bassmaster Classic and Howell Wins Bassmaster Classic . (2/24) On Bowstring Lake, Erin at Geiger's Trails End Resort; "Plowing snow was the name of the game on Sunday. Access has been restored to the areas along the North shore that were producing fish before the storm. Crappie action held up fairly well for Zach Dagel and his crew on Sunday and they managed to pull out another limit out of the Crappie hole. With a new snow plow installed and a week of cold, stable weather, all of the old roads should be restored by the weekend. With a bit of luck, we mave even have some fresh territory opened up before the inevitable spring movements begin." - Erin and Bill Charlton, Trails End Resort . (2/24) On Lake of the Woods, Border View Lodge, Mike Kinsella wrote; "Another windy weekend is behind us! More snow and wind made some really large drifts by the fish houses and along the road. We continue to maintain our road and use bombers to get out fishing. With multiple locations on the lake it also gives us different options when the visibility is poor. The bite is still making anglers work and the electronics are definitely a help. We have not seen the suspended fish this season but the electronics are allowing anglers to work fish off the bottom and coax them into taking their bait. We have our houses in the 30 foot range. Back into the deep freeze we go. This week’s forecast says we will get back to the 20 below temps by midweek and staying below zero over the weekend." 1-800-776-3474 Border View Lodge . (2/24) Gus Sheker, Gus' Place Resort on Ball Club Lake; "The Ideal ice fishing conditions we enjoyed only a few days ago have ended with winter storm Seneca. Our well groomed road has been closed by drifting snow and may never be completely reopened. Some sections will be passable in a few days, but most likely we will give up sections as the slush season starts. That doesn't mean that you waon't be able to fish though. Our customers whio have snowmobiles are getting around and doing well. They have been picking up some nice Crappie, suspended in 15-18 feet. There is still plenty of time to do a little Cold Footing. Get in touch, then get out there and fish." - Gus Sheker. Gus' Place Resort . 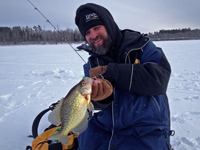 Ice Fishing Report February 24, 2014 Jeff Sundin - "Seperation Anxiety, Who Knew?" - Minnesota is having a little trouble letting go of it's winter White security blanket. I Know, it would be so simple to just give in, just enjoy a little warmth. But in spite of longer days, brighter sunshine and bluer skies, she's gonna pretend that she likes that icy wall better. I wish that I could tell you how many times that my plans have been messed up this winter because of it. But, it's already happened so often, that I can't begin to figure out what went wrong and where to start counting. That aside, we are just gonna have to figure out how to shrug it off for another week. Another blast of sub-zero temperatures are rolling in and the only good thing to say about that, is that we won't have to move much snow. Knowing that paybacks are joyous and wonderful, I'll do my best to make a good week out of it. I can take my comfort from every little clue that warmer days lie ahead. The weekend didn't produce a lot of fishing news, especially "new-news". So for today, it's better if I just keep it short and pass along the notes that I do have. Ice Fishing Report February 23, 2014 Jeff Sundin - "Digging Out From Winter Storm" - Funny how a little inclement weather can make things happen. After working all winter long to get a good road system established, ambitious rental operators didn't sit around looking at snow drifts on Saturday. They still have some work to do, but there was already a lot of progress in the effort to get the roads plowed back open. I'm not so sure that fishing in the aftermath or the storm was a lot of fun on Saturday. But for ice fishermen who did have access to good shelters, there were places to go out and wet a line. As we passed the North side of Bowstring Lake on our way to the Sand lake Lutefisk Party, it was obvious that the crew from Trails End Resort was on the job. By late afternoon, the main road out to the "Crappie Hole" had been restored and there were several groups of fishermen set up. OH by the way, for Walleye, Pike and Bass fishermen, that's a wrap. Yesterday was the season close and from now until May 10, 2014, anglers who want to fish for Pike and Walleye will have to head for border water. Mississippi and Rainy Rivers, Lake of the Woods, Rainy Lake ... you get the idea. According to my Sun Dial, we could be on the water, at my favorite spot for giagantic Walleyes within the next 30 days, give or take ... :)!! (2/23) On Lake Winnibigoshish Heavy drifting left some anglers with wheel houses stranded. Spending the night in a nice, warm shelter probably was a better idea than trying to drive home in the storm. But staying out on the lake also meant that there would be lots of work to do on Saturday morning. There was a lot of progress and by days end today, access to most or these shelters will be plowed back open. But for what it's worth; If I had a wheel house out there right now, I'd play it safe and move it up to the shoreline. With the amount of new snow that just added to the weight of the surface, predicting slush problems ahead should be a fairly safe bet. During our party last night, a conversation between I and a friend lead to this conclusion. Large, comfortable "wheel houses" are wonderful to fish in and they are a fantastic thing to RENT FROM A PROFESSIONAL. For most of us, there's not enough time throughout the season to keep up with all of the moves and snow plowing to make them worthwhile. For me, access to quality fishing spots is achieved much more easily with a snow machine and a portable shelter. I don't know how longs it's been since you sat down inside a portable. But the newer, insulated covers that they use these days are absolutely wonderful. A good wheel house, even if you find a used one, is going to set you back somewhere between $5000.00 and $15,000.00. Compare that to the cost of a reliable snow machine and an up to date portable shack (even at the low end of that price range) and you can call the money a wash. But, your access to good fishing improves dramatically. Just a thought. (2/23) On Bowstring Lake, Erin at Geiger's Trails End Resort; "Hello to ALL fellow Anglers big and small! Due to a broken plow, we are struggling. However, we are beginning the dig out process. Hopefully, by this afternoon, we will back open. Bill, Dane and a good friend, Zach Dagel, who is lending his plowing services to us while we get a new plow installed, are going to be working all day to gain access. Please be patient with us at Geiger's Trails End Resort. We are working hard to get you back out on the ice!" - Erin and Bill Charlton, Trails End Resort . 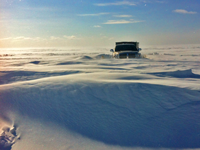 Ice Fishing Report February 22, 2014 Jeff Sundin - "Digging Out From Winter Storm" There wasn't a whole lot of new fishing news on Friday. In fact, I don't think that there was a whole lot of fishing going on. Heavy snow and high winds caused lots of problems for rental operators and most of the surface territory on the ice has been transformed from plowed roads, back into deep white snow drifts. There will be news developing throughout the day as we all dig out from under the snow. But for anglers who were planning to fish this morning, it will be best to assume that road accesses are either closed or restricted . Ice Fishing Report February 21, 2014 Jeff Sundin - "Hmm.. Never Thought About That?" Whenever I head out of the door to go fishing, my mind spins around a simple, yes/no question. Will the fish bite for us today or not? Sometimes I forget about variations like; "What if they bite, but ...?" There we were, after all of the hubbub about getting to the lake during pre-dawn darkness, it was a whole different day than the one previous. Instead of an intense sunrise and sharply contrasting light conditions like we saw on Wendesday, Thursday's morning crept in slowly. It seemed like it took forever to arrive and instead of a hot bite, the fish count after our first hour of daylight was holding steady at zippo. I did my best to keep the crew optimistic, but they were losing interest fast. It was easier for me because I Already Know, every single day of Trout fishing this winter has been the same, it's been just like real life. Nothing ever happens until I'm just about ready to throw in the towel. Most days, my brain starts to wander and I begin worrying about this or that and then all of the sudden, Wham! Some nice surprise comes bursting out of nowhere. So that's why I was still holding out hope that the fish would show up sometime before the crew went into a full fledged mutiny mode. The fish did show, but this time even that didn't help. That's because when the first wave of fish finally showed up at about 7:30, they did bite, but these fish were so small that it actually made matters worse. Already frustrated by the lack of our anticipated "Early Bite", the small fish just added fuel to the "let's get out of here" fire that was already burning. There were non-believers in the room and I wasn't gonna change their minds. For them, it was time to pack it in and head for something a little more action packed. So, we packed up and headed across county for "Plan B, Phase 2". Luckily, when we got there, the Crappies that have been fairly cooperative for the past few weeks were still in the same spot where we left 'em last time. The action was better, the fishing trip was saved and I was a hero again, hooray! (2/21) Meanwhile, on Lake Winnibigoshish "All of the leading indicators turned Green, sending Perch action deep into positive territory. Zach Dagel's crew showed up a half day early for their fishing trip and I'll bet that they are glad they did. They showed up on the West side of Lake Winnie just in time to get in on what one angler called "the best Perch action of the winter". Fishing shoreline breaks along the West shore, the crew found good numbers of fish in about 8 feet of water. According to Dagel, action was good and he estimated that they iced 100 or more fish. Getting good keepers was easier than it's been so far too. They still had to do a fair amount of sorting, but getting fish over 10 inches was common. The best Perch of the day was a 14 incher caught by Dylan Tjernagel. Dylan was using a Lindy Ice Worm tipped with a Wax worm. Feeding on small Crayfish is a favorite passtime for Perch. Discovered by Dagel in the fish cleaning shack, young Crawdads were among the stomach contents of their catch. That means that it is likely evidence that Perch will remain in the area for a while. (2/21) On Lake Winnibigoshish, Ryan Peterson echoed the report about good West side Perch action and added; "We're getting a nice run of Walleyes during the evening too. With this new snowfall, travel conditions are going to be a little tougher because some of the roads are already drifting in. There is a lot of traffic out there now and we'll be able to keep sending folks out, but we will need to pull back on the "Big Shacks" a little." Good Luck! >> Good Luck! >> Ryan Peterson's Guiding . Ice Fishing Report February 20, 2014 Jeff Sundin - "Fool Me Once ... "Well, it looks like we showed up a little late to the party on Wednesday and wound up missing our spots in the reserved seating section. "Plan A" didn't turn out quite the way we expected it to, but combining the lesson we learned with a little extra coaching from a helpful ice fisherman, we decided instead to make a quick switch to Plan B. Luckily for CR, ST# 003, "Plan B" worked out better. For today, we've registered for an official Pre-Dawn Do-Over. After setting the alarms ahead on our sun dials, we're poised for a brilliant recovery. It's 4:00 AM and we are re-grouped, re-loaded and on the road! Don't worry, you'll hear all about it as soon as I can get back into the office. Ice Fishing Report February 19, 2014 Jeff Sundin - "Our Tardy January Thaw" - So it's a little behind schedule, better late than never right? On Tuesday, the warm sunshine and high blue skies brought anglers out from behind every tree, even I and Zach Dagel. Planning ahead for an upcoming guide trip, Zach wanted to make a run back up to Bowstring Lake to check on the action. The following report from Erin at Trails End Resort sort of summed it up, so skip to that first and then I'll wrap it up afterward. (2/19) On Bowstring Lake, Erin at Geiger's Trails End Resort; "Well, it’s not a secret anymore…the Crappie bite on Bowstring has been fantastic. The recent snow storm has slowed them down a bit. They didn’t seem to bite hard and heavy today. We had bright skies. The weatherman is threatening another snow storm for most of MN on Thursday…Our honey hole has continued to produce some fish. Please take care of our areas lakes. Clean up your mess. Please do not leave a bunch of garbage on the ice. Bill and I kindly request that no one drill holes on our road. We are still running our winter special, but cabins are filling up fast, so please call in advance to make sure we still have room. Spring and summer reservations are strong too, but we've still got some room if you plan now. Don’t forget about our Pizza on the ice! We will deliver so you never have to miss a single bite!" - Erin and Bill Charlton, Trails End Resort . For Zach and I, finding the fish wasn't impossible, but we did have to move around to do it. Since the recent snowstorm, anglers who show up without snowmobiles (including us) have become more dependent on using the plowed roads. So using a good chart to help find a spot has become more important. Most everyone on the lake knows about the Crappie spots that have already been discovered. We figured out that finding fresh schools of fish required a specific strategy. Crappies are located in deep water, but for us, the deep water needs to lie adjacent to structure. When we tried drilling holes in random order above the deep water holes, we were frequently disappointed with the results. Drilling along the edges of large deep water flats turned out to be a much better strategy. Key depths for us ranged between 24 and 26 feet. If we moved too far on top (shallower) of the flats, nothing happened. Too far out into the center of the deep hole? Nope, nothing happened there either. Finding small schools of fish along the breakline was the winning strategy. I need to cut it short this morning becauise a special fishing project has me leaving the office early. But I will pick up where this leaves off tomorrow morning. Ice Fishing Report February 18, 2014 Jeff Sundin - "Where Have All The Perch Gone?" - I can remember like it was yesterday, first moving into the Deer River area 30 years ago and discovering that there were Perch everywhere. Nice ones, Jumbos and in good numbers too. If you would have taken me to the side and said that in 30 years, I'd have a harder time finding good Perch fishing than I would coming up with a great Crappie bite, I'd have chuckled and shrugged it off. Sucker Bay. Took a beating, 16 keeper Perch, Two Walleye, One Northern. Nobody in the Groups that were out there caught much of anything. I wasn't with them, but it is first hand info. It will be interesting to see how all the walleye stocking on Leech over the past years affects Perch fishing for the next ten years on that lake. I love Perch fishing, and I enjoy Leech, I do wonder how long it will be before I have to find a different lake. Maybe not at all though? A) At the moment, I have more questions than answers, but in light of the odd weather we've had this winter, I'd say that it's probably environmental more than anything. I don't think it's due to the Walleyes, because Leech Lake, along with many other area lakes are chock full of small perch right now. These small ones would be the Walleyes favorite food source and if they were causing the trouble, it would be harder to find schools of 4 to 6 inch Perch. I just think that there's probably a bubble right now. We had some awesome Perch fishing a couple of winters back and I'd bet that the fish were their own worst enemies at that time. Not just on leech lake but everywhere. It's seems like we're missing a couple of year classes right now. That combined with an abundance of forage can make it seem like the Perch populations are even worse than they are. With the end of the Walleye and Pike season, there will be a lot more focus on Perch fishing and I'll make a special point of asking these questions around people who can help get us some answers. In the meantime, there's a way to share your opinion, just click >> Fishing Reports Minnesota and give us your thoughts. (2/18) Gus Sheker, Gus' Place Resort on Ball Club Lake; "Ball Club Lake is one of those peculiar area lakes that is outside or escapes the collective unconscious of all of its neighboring lakes. That is to say; when the summer heats up and the “Dog Days” consume most area lakes, Ball Club Lakes cold clean water can produce some of the best fishing in the area. From the middle of July to the end of August our area Guides use and rely on Ball Club Lake for what they call, “action fishing” The same is true during the winter months when many area lakes slow down during February. Ball Club lake has been giving up a really great mixed bag of fish the last two weeks, Perch, Walleye, Northern and some White Fish. We are hooking up in the shallow 10 foot range again, especially the large, fat female Perch. Walleye has been best in the dawn early morning hours in 20 feet and Perch & Northern have been biting throughout the day. The best bait has been live whole minnows or swimming jigs with minnow heads while chumming the minnow body. Tire chained 4X4 pickups and snow mobiles are your best bet for off road lake travel. Now that the distraction for Walleye & Northern is nearly over as the season draws to a close we can zero in and focus on the plentiful Perch and sometimes the Crappie on Ball Club Lake. There is still plenty of time to do a little Cold Footing. Get out there and fish." - Gus Sheker. Gus' Place Resort . (2/18) From The Iron Range, Greg Clusiau; "An early morning snowmobile ride to a trophy bluegill lake had me pumped. At minus ten below, it was a little cool out but little did I think that full face protection would be needed. It wasn’t that far. Well, yeah. Little did I think. I should have known better. Luckily the Bearcat had a high windshield and provided me a little shelter from the wind. I did, however, have to keep peeking over it, as it was crusted over with frozen road debris and hard to see. The ride, which approached unbearable, ended with us reaching our little back-in-the-bush honey hole and I could feel the ... " >> Read Greg's Full Report . (2/18) At Freds Bait in Deer River, Bill Powell said that the shop was hopping on Saturday morning. Walleye fishermen heading for Red Lake or Lake of the Woods, along with Perch and panfish anglers heading for local lakes kept him busier than usual. That's good news because after a slow start to the ice fishing season, a strong late winter ice fishing season could be just what the doctor ordered. Especially in light of another complicated srping minnow trapping season lying ahead. I wish that ice fishermen would keep something in mind, as a favor. There are tons of things that we have to buy at the big box stores already. They're gonna get a bunch of our cash whether we like it or not. But when you're heading for the lake, try to pick up the lion's share of your tackle and accessories at the smaller, local bait shops. Here's something to think about; What happens when you have all of the fancy gear in the world, but can't find a minnow or a night crawler to pin onto your hook? (2/18) At Freds Bait in Deer River, In an open letter to fishing tackle manufacturers, anglers and legislators Bill Powell says; "As the Minnesota DNR continues to plague us with a never ending string of “red tape” a continual supply of more stringent, less reasonable restrictions, the future isn't looking all that bright. Already weary from regulations that we belive were “strict enough” in the first place, some harvesters, now facing outright bans on minnow trapping, are throwing in the towell, calling it quits. Bans placed on trapping minnows that we've already proven can be trapped safely. Go ahead, do the math; $30,000.00 dollar boat, $40,000.00 truck, $15,000.00 wheel house, or a $200 dollar fishing pole. You are still going to need a simple scoop of minnows. read full report >> Shiner Harvest Ban On Lake Winnie . (2/17) Leech Lake Area Lakes, Gary Roerick Says; "Time for Some Pout’n! February 16, 2014! - This Thursday February 20th, the 35th Annual International Eelpout Festival kicks into action in beautiful Walker MN. The festival runs for 4 days and ends on Sunday February 23rd. For all of the official information you can visit the on-line websites or contact the Leech Lake Area Chamber of Commerce in downtown Walker. Ice conditions should be excellent for this event with most places measuring near the 30” thick mark. Weather conditions appear to be heating up and should be near perfect to accommodate this type of festival. The national weather service is saying temperatures in the 30’s for the start of the festival and temperatures in the teens as we move into the weekend. 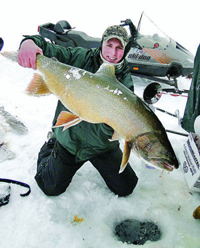 It’s time to dig out those eelpout lures for the fish-off later this week. There are many great prizes to be awarded so it is now or never to catch one of the ugliest, bottom-dwelling, carnivorous fish in our area waters! I prefer to use any type of jigging lure that glows in the dark. Lures such as, but not limited to, Buckshot rattle jigs, Jig-a-whoppers, Frostee jigs, or any other type of jigging lures that glow in the dark. Make sure that you have a tazer light, camera flash, or other types of lights that will make your lure glow when hit with the light. I like to use the front half of a live minnow for the bait, however, lately there have been a fair amount of customers using rattle wheels at night, tipped with a live minnow hanging down within one foot of the bottom of the lake. Looking forward to seeing many of you out Pout’n later this week!" - Gary Roerick Roerick Fish House Rentals 218-224-2836 . Smiles are always welcome! And I AM ... Because speaking of Eelpout reminds me; Did you know that the Eelpout is a Cod Fish? Yes, that's right a fresh water Cod. Atlantic Cod fish is what the ancient Norwegians used in their recipes for making Lutefisk and the tradition is still alive and well. Which brings me to my point, the annual Sand Land Lutefisk Party is coming this weekend and I will be grinning this year because both of my girls will be home for the event this winter. Hot Diggety! Just for fun ... you can get a reminder of what all of the hubub is about by watching our home-brewed video called >> Ya' Don't Need No Teeth Ta' Eat Lutefisk . (2/18) An email from Wally Benson asks; "What is going to happen this spring with the spottail shiner for Winnie? A) Wally, as it stands today, the ban on Spottail Shiner Harvest will continue for the spring of 2014. Some of the area bait dealers have been working with the MN DNR behind the scenes, but progress has been tough to come by. Just yesterday, Bill Powell from Fred's Bait Shop in Deer River issued an open letter to fishing tackle manufacturers and other small businesses who depend on fishing tourism. I don't think that the letter has even been mailed out yet, but here's a sneak preview of what it says >> Bill Powell Shiner Harvest Ban On Lake Winnibigoshish . (2/18) "The Miami International Boat Show (February 13-17, 2014) recently featured best-in-class fishfinder technology embodied by ION™, ONIX™ and several completely redesigned fishfinder series, including new 800, 900 and 1100 units at a reduced price for 2014. Standing by a commitment to design and manufacture the best sonar units in the marketplace and offer customers the highest level of performance, value and support available, Humminbird is proud announce even more pro features and enhanced aesthetics at a lower price. In fact, many units are priced significantly lower – up to $500 less – than the previous generation product without any compromise in performance or quality. All 800, 900 and 1100 units are still designed, manufactured and built to the highest quality control standards at its state-of-the-art manufacturing facility in Eufaula, Alabama, USA—also headquarters for Humminbird’s best-in-class technical and ... >> Read Entire Article Humminbird Pro Units at Reduced Price . (2/17) As you approach the news stand to pick up your morning paper, be sure to grab this weeks copy of the Outdoor News too. 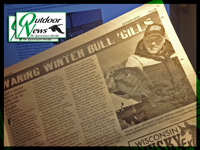 Dan Johnson, All Creation Outdoor Media caught up with me while he was working on an article about fishing for late winter Bluegills. In this issue, Dan has contributed a particularly good piece and the tips in this article will help you catch more fish right now, this week. They already did help me, just this past Wednesday. (2/17) On Lake of the Woods, Border View Lodge, Mike Kinsella wrote; "The trend this past week continued with anglers who are working their jigs and using electronics having greater success. There have been great catches in the mud areas and the reef areas. We are still spread out in different areas fishing depths from 31 to 36 feet of water. We have moved some houses back in towards Pine Island this past week. Gold and glow red have been the hot jigs of the week. The forecast for the week ahead shows it to be above zero all week long. Although today we started out at -21 and it is expected to become 19, which is a big temperature change for one day. FISH ON!" 1-800-776-3474 Border View Lodge . (2/17) Happy Birthday Mercury Marine! "Here is a short video on the history of Mercury Marine. There is also an interesting timeline on mercurymarine.com where Mercury Marine started and how it has progressed in 75 years. Congratulations Mercury on 75 years of providing boaters and anglers with machines to push their water sleds around. View Video >> Happy Birthday Mercury Marine . Lake Okeechobee, FL (February 12, 2014) - Phoenix, Arizona-based bass pro Brett Hite recently took tops on the ‘Big O’, weighing a four-day total of 88-14, 6-pounds, 6-ounces heavier than his nearest competitor, fellow Humminbird/Minn Kota pro Greg Bohannan. The $125,000 win marks Hite’s first on Okeechobee, although he’s no stranger to Florida bass. In 2008 he took first just up the chain on Kissimmee with an FLW record-winning margin of 20-pounds 4-ounces. Like many west coast anglers, Hite’s at home in deep, offshore situations with finesse tactics, but he’s quickly earned respect as a double threat for his shallow-water power fishing game. Read Full Story >> Hite Credits FLW Win To ‘Time Management’ . 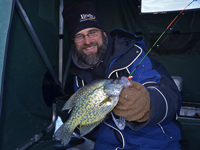 Ice Fishing Report February 16, 2014 Jeff Sundin - "Late Winter Ice Season Is Upon Us" - As we enter the last full week of the Walleye and Pike fishing season, Mother Nature appears to be planning a special send-off. A full week of fishing with high temperatures above the freezing mark. My slide rule is in the repair shop right now. But even if I use just my fingers and toes, I know for a fact that we haven't seen a high temperature above the 32 degree mark for at least 20 days and if I borrow your fingers and toes, we'll run the total up to 40 in no time! 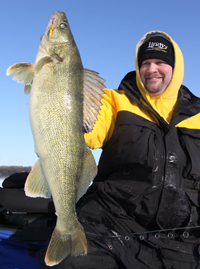 February 23, 2014 - Walleye, Pike and Bass season ends next Sunday. March 3, 2014 - Ice Fishing Shelters must be off of the ice after dark (unless attended) beginning on March 3rd for anglers south of US Hwy 10, MN Hwy 34, MN Hwy 200 and US Hwy 2 . March 17, 2014 - Ice Fishing Shelters must be off of the ice after dark (unless attended) beginning on March 17th for anglers north of US Hwy 10, MN Hwy 34, MN Hwy 200 and US Hwy 2 . 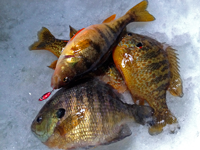 Ice Fishing Report February 15, 2014 Jeff Sundin - "Fishing Plan B Outshines Plan A" - After spending a couple of weeks hoping to learn about a quality Perch fishing spot, I'd given in to the notion that it just wasn't happening, at least not right now. My mind, occupied mostly with the search Crappie, Bluegill and Trout fishing had been focused on deep water. Conventional wisdom would allow for the idea that sooner or later we'd stumble into some good Perch during our search. That hasn't happened so far, so fishing for Perch was placed far onto the back burner. There was one spot that had been haunting me all week long though. A shallow area of mixed weeds, clam beds and gravel that have been know to hold schools of good size Perch during past ice fishing seasons. Sooner or later, I planned on getting there to find out. Sooner came sooner than I thought it would. Thanks to yesterday's snowfall, my canceled Trout fishing trip became an opportunity to check out the shallow water Perch hole instead. I got in touch with two of my favorite fishing buddies Arne Danielson and Bill Powell. Somehow the planets were aligned just right and all three of us were able to be there to check it out. Some of the Perch, "Plan A", were there. But their presence was soon overshadowed by "Plan B", mixed schools of Sunfish, Bluegills and Crappies. We had stumbled into a territory where small packs of fish were roaming a shallow flat in roughly 7 feet of water. Pinning them down wasn't really possible, all three of us experienced the same pattern. Fish would appear on the electronics, bite for a minute or two and then move on. Like Arne said; "You gotta catch as many as you can before they leave and then wait for a new batch to move in". For me, the Red Glow Frostee Jigging Spoon was hitting a home run. Tipped with two or three Wax Worms, Perch and Sunfish were all over this bait. I know that it was making a big difference because late into the trip, Arne hit a dry spell. After I finally twisted his arm, he accepted my offer to borrow the rod and bait that I'd been using. He dropped it into the water and his dry spell ended immediately. The action was good for all of us until about 5:30 when there was a noticeable lull. That gave us a good excuse to fire up the snowmobiles and head for home. On my way home, I did a quick mental inventory of Itasca area lakes where this could be happening. I've already come up with a couple of dozen ideas, some big, some small and some in between. Here's something to think about. If you know about a lake that has A) A mixed population of Perch, Sunfish and Crappies and B) Has large areas of shallow water cover like Wild Rice, Bulrush or Milfoil, then there's a good chance that you can duplicate this pattern by fishing the shallow flats located near, the shallow cover. I'll be testing the theory myself over the next few days and if it keeps working, you'll be the first to know. (2/15) Handheld GPS and Lakemaster Maps? An FB message from Brad Hiljus asks; "I was wondering if there is a handheld GPS that accepts lakemaster chips? If there is, would you recommend one over another and why? I think it would be handy for ice fishing. A) Brad, I don't believe that there are any current model handheld GPS units that accept Lakemaster's SD Map Cards. At least if there is, I don't know about one. For me, it's a moot point anyhow. As my eyes have grown older, I've gotten tired of trying to read the small, dark screens of handheld units. There's nothing more frustrating than traveling accross the lake with a snowmobile helmet on, trying to see the destination on a tiny screen. It's a very handy gadget and it provides everything I need in terms of a bright, large screen GPS Chart. Plus, it's got a great sonar for fishing built right into the package. You can learn more by clicking here >> Humminbird 386ci Combo . (2/15) On Lake Winnibigoshish, Ryan Peterson checked in; "Fishing over the last week has been decent, best depths have been 20 to 27 fow still doing some sorting for decent perch but most groups are reporting enough decent ones to keep them busy. Walleyes have been biting the last hour or two before dark jigging spoons tipped with a minnow head have been working best although dead sticks have been catching a few also. Denny's Resort has a great road system to get to new fishing grounds and with the weather looking up we are looking forward to the last 10 days of the walleye and pike season." Good Luck! >> Ryan Peterson's Guiding . (2/15) On Bowstring Lake, Erin at Geiger's Trails End Resort; "Bill and Dane are working like madmen to keep the roads open. With that being said…they are open and seeing lots of traffic. The bite is still hot and heavy, but may I add a little advice…The Perch and Sunnies seam to like the BRIGHT skies…the Crappies like the Gray skies…adjust accordingly and there will be great day for fishing. As for the walleyes, they are very picky and are trying to bite at sundown! Good luck out there! Our cabins are filling up fast, please call in advance to make sure we have room. Please, don’t forget about our Pizza on the ice! We will deliver!" - Erin and Bill Charlton, Trails End Resort . (2/15) Trout Fishing Grand Rapids Area Lakes, Bill Treichel wrote on my facebook page; "We fished for Trout on (a Grand Rapids Area Lake) today. I iced a 19 inch rainbow on foo flyer tipped with a whatsit (white). Go team lindy! Love the whatsits. It was yummy!. I was trying to not get a ticket too thanks for info. Sounds like that lake is closer to me. Another fisherman did well on on the same lake, he saw 7 and iced 2 nice rainbows too. We may try a (another lake) this weekend that the other fisherman suggested. He said that he liked numbers caught on that lake. We noticed that the lake did not have much ice on it. Congratulations Bill! A 19 inch rainbow would be a thrill for anyone! Sounds like you're on the right track already! Thank you! Got lucky but now I've got the itch. They fight harder than smallies and are delicious table fare. Hoping it warms up enough to smoke the tulibee we, ( mostly Karrie) caught on Lake of the Woods last weekend. Can't wait to taste the finished product. Thank you for all your hard work educating fisher people. We have learned so much from you. Have a great night! (2/14) An email question about fishing electronics from Kevin Scott; "Jeff, I am looking to purchase new electronics for my boat. I dont want to purchase the wrong thing so need your recomendations. I just have a 16 ft Lund Rebel Back troller and currently have an xoxo :)!! . I am getting older so I am thinking larger screen. Want to get something good but not break the bank. A) Kevin, I've owned an operated the same unit you mentioned and in it's day, that was a really fine unit. But today, you are in for a real treat because the advances in electonics since that one was introduced will amaze you. Drawing a conclusion based on the unit that you currently operate, I 'll bet that you're going to hang on to the next one for a long time. Bear in mind that if you spread out the cost over the next ten years, giving up one cup of coffee each week is going to pay for a mighty fine piece of equipment. Equipment that serves as your eyes and ears, your only contact with the fish. So don't skimp too much. Without knowing all of the particluars about how and where you plan to use your new unit, it would be tricky to dial in the exact one that you'll want. So let's start with what I use. 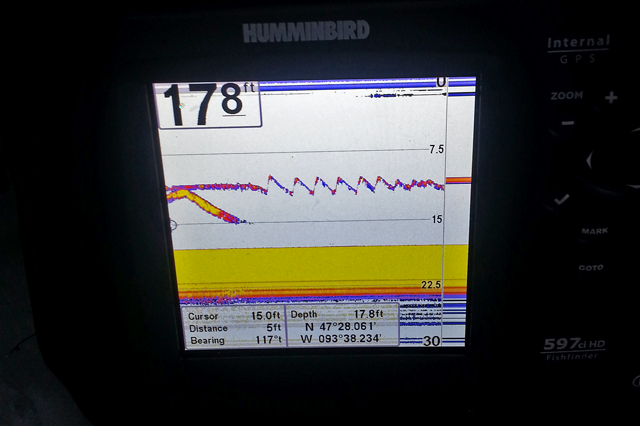 For me, Humminbird has been the "real deal". I've used a bunch or their units now and they have been reliable, accurate and easy to use. On my boat, Humminbird's 998 HD SI Combo provides everything I need to get the job done. It has a large enough screen to allow viewing the Lakemaster charts at the same time that I'm watching my sonar. The display is bright and easy to read, even in bright sunlight and I love the glass screen because a soft cloth and a little vinegar keeps it sparkling clean. By the way, That was a tip from a very smart angler and it really works! What you will love about the Humminbird lineup is that all of the models operate the same way, the only differences between units is the screen size and the variation of features. I think that you'll really like the simplicity of the control menu too. The easy way to narrow down your choices is to begin by describing your desired outcome, including your price range. Select the features that are most important to you. For example, my 999 has almost all of the bells and whistles You can break it down by using their product number 999 = Larger 8 inch screen, HD = High Definition, SI = Side Imaging and COMBO means that it is a GPS/Sonar Combination. If I didn't need one of these features, or if I could get by with a smaller screen size, then I could pick and choose the units that provide only the options that I really want. It's sort of an ala cart system. For example, the 688 HD Combo operates the same way as my 999 except that it provides a more basic package of features and a smaller screen at a very affordable price. You can pin me down for more specific ideas by simply shooting me another email aimed at defining the most important features. Or you can do your own homework by using this link >> Humminbird Products . "Jeff Sundin was right. It's far better to have to quit fishing when you really don't want to than to endure the end of a day when you are eager to be done. Still, pulling big 'gills from little holes in the ice is just so fun that I had a hard time resolving to reel my jig up once and for all. The sun was sinking, though, and the day's work was done, so I bid the ice, the crappie and the bluegills farewell." Now that we've got that project wrapped up, it's time to move out early this morning for last pre-dawn fishing expedition. I'll be back in the morning! 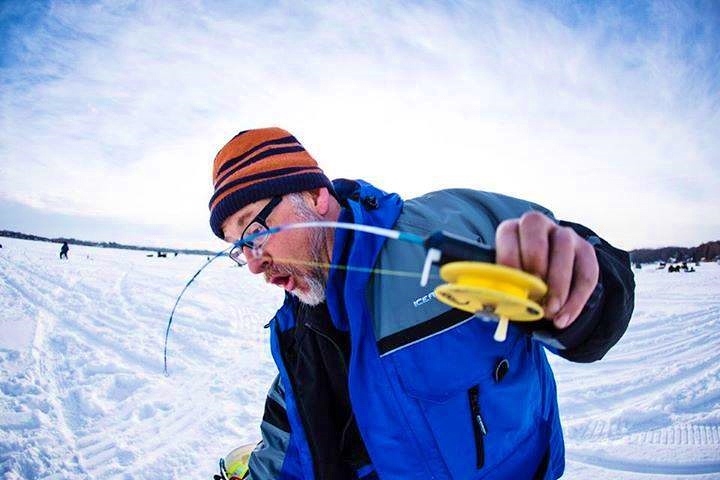 Ice Fishing Report February 12, 2014 Jeff Sundin - "Cold Weather, Hot Fishing" - When I bump into folks around town, they all react the same way when they hear that we've been on the ice almost every day. "That must be miserable, too cold for me, you're not gonna get me out there and ... well, ... You Know The Rest. But guess what? It may be icy cold, but it's a far cry from being miserable. Especially when we've been enjoying the full cooperation of the fish these days. 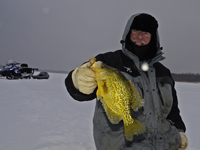 "Cold Weather, Hot Fishing" Is the headline on Jeff Samsel's blog entry this morning. He goes on to say; "Because cold front conditions legitimately do affect fish behavior under the ice, just as they do in most other fishing settings, fishermen have a general perception that extreme cold equals tough fishing. That's not always true, as Jeff Sundin has seen for the last month or more. Temperatures in Northern Minnesota have been brutally cold (even for Northern Minnesota), but it has been that way every day, which has made conditions stable the fish's behavior predictable. Jeff has shown me that first hand for the past couple of big days, with jumbo bluegill and nice crappie that haven't been the least bit shy about eating. This morning it was ..." Read >> Jeff Samsel "Cold Weather, Hot Fishing" . By the way, it's another lucky day for me because I get to spend one more day on the ice with Jeff. I don't want to speak too soon because we're gonna try something a little off beat today, something special. Let's just say that I have my fingers crossed that we'll see a few fish on this day too. 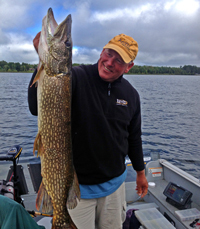 (2/12) Leech Lake Area Lakes, Gary Roerick Says; " ‘gills, gators, and ‘eyes on the side! 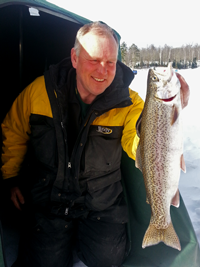 February 9, 2014 - This past week proved to be very successful for many fishermen in the Leech Lake Area. The largest “gator” (northern pike) caught in one of my houses was just over 12 pounds. Most customers caught limits of nice ‘gills on their outings to our sleepers on an area pan fish lake. Many of the fishermen on Walker Bay of Leech Lake reported catching a variety of smaller ‘eyes during the evening twilight bite. With the extreme cold temperatures, the ice thickness continues to grow in depth. Many of the area lakes are in the 24” to 30” thick category. Slush is nearly non-existent on most area lakes. One other ice issue that we usually deal with on Walker Bay is Ice heaves and they are essentially non-existent as well. We are currently catching sunfish and crappies in approximately 25’ of water. The pan fish are suspended up off of the bottom and located 10’ to 15’ down. Good electronics are almost a must for these types of fishing opportunities. This past weekend I was demonstrating how to use my Marcum fish locator to a customer and when I started the locator it was showing fish scattered throughout the upper portion of the water column. The customer was curious how I knew they were fish markings so I continued my demonstration of equipment he had rented. I turned on the Aqua-Vu camera in a different fishing hole in the fish house and the viewfinder was showing lots of bluegills scattered throughout the viewing area. The fishing customer thought I had a video tape running rather than live footage of 5 to 10 bluegills in the viewfinder at any one time until he started catching many fish in the same hole. We are nearing the home stretch of game fishing and/or spearing in our Minnesota waters as the seasons are now down to less than 2 weeks remaining. The last day for angling largemouth or smallmouth bass, walleye and northern pike, is February 23rd. 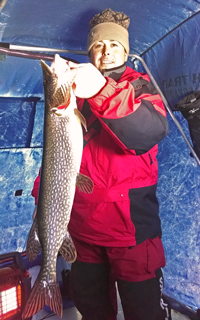 The last day for spearing northern pike or rough fish through the ice is also February 23rd. You can reference the 2013 Minnesota Fishing Regulations booklet for more detailed information. Give me a call at 218-760-8266 if you would like to get involved with some late season spearing or sleeper house fishing opportunities! Happy Fishing!" - Gary Roerick Roerick Fish House Rentals 218-224-2836 . (2/12) Gus Sheker, Gus' Place Resort on Ball Club Lake; "Really cold weather makes really good ice! The ice cap on the lake is near 30 inches and the lack of any recent snow has the conditions on the lake near ideal. Four wheel drive trucks are able to access large parts of the lake off the resort plowed road. Fishing is very good in 20-25 feet and we are catching Perch, Northern, Walleye and White Fish all in the same holes. Whole live minnows have been the bait of choice for most anglers. Later this month we will start looking for fish in the 12 foot depths as we get warmer, longer days. Get out on the lake, Walleye & Northern season closes in a couple of weeks." - Gus Sheker. Gus' Place Resort . (2/12) From the Lake Winnie Region, Nik Dimich says; "Perch fishing ramped up to a good “action” bite. Still, some sorting has been in order to fill a bucket. Due to the fish being on a minnow bite, and the minnows have been moving, a “run and gun” approach has helped. As the perch move into the deeper water saddles with soft spots in the bottom and feed on larvae and bug hatches they will become more stationary, but for now it is a “chasing” game. Don’t overlook the shallows, however, as some perch schools are still biting there. Because each lake varies in depth and has varying types of structure which hold fish differently, look for inside turns and " ... Read >> Nik Dimich Fishing Report . (2/12) On Bowstring Lake, Bowstring Shores Resort, Darv Oelke says; "Travel is pretty Good on Bowstring. Guys this week end did well on the perch and crappies and walleye bite for them was great. They are using the north public acess. Driving on the with pickups and fishhouses I seen this morning. Walleyes are 15 to 18 feet. Perch 14 to 18. And Crappies are 20 to 26 mostly on the north end of the lake."" - Darv, Bowstring Shores Resort 218-832-3101 . (2/12) From Wired2Fish: Major League Fishing Doubles, Adding 24 Anglers - "Major League Fishing will double in size in 2014 by adding two events and 24 new anglers. The new events will be sponsored by GEICO. Called the GEICO Selects, the events will be filmed this year and televised early in 2015 by Outdoor Channel. Prior to their television run, the two events – the Summit Select and the Challenge Select – will be aired as extended-coverage, web-based broadcasts. The new Major League Fishing anglers are ... Read Story >> Major League Fishing Adding 24 Anglers. 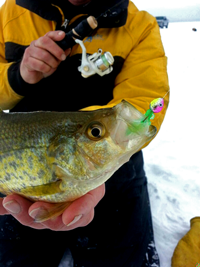 Ice Fishing Report February 11, 2014 Jeff Sundin - "Don't It Always Seem To Go. You Don't Know What You've Got Till It's .... ?" Cold conditions may not seem too appealing, but along with the cold, there's been tremendous stability. Fish locations and feeding patterns have become easily predictable and for the hearty ice fisherman, this has been a really productive period. Funny how that works isn't it? With a new warmer, more turbulent weather pattern pushing it's way in, I have to wonder; Are we gonna be ready to make some adjustments? Or are we gonna get caught off guard? Just something to think about, just something to plan for. It's not every day that I can let you know about my fishing experiences without having to write about it myself. But today, I can introduce you to yesterday's fishing partner and let him do all of the talking for me. So without further adieu, I Will Be Seeing You and ... You Know ... the rest of the story >> Jeff Samsel's "My Kind Of Fishing Day" . 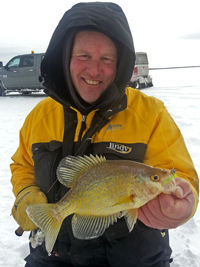 Ice Fishing Report February 10, 2014 Jeff Sundin - Lake Winnibigoshish Ice Fishing Action Heats Up As the network of plowed roads expands on Big Winnie, most anglers have options. 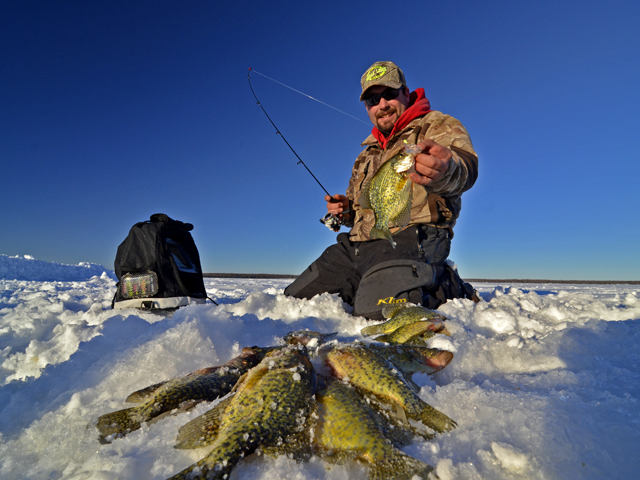 With most slush problems are behind us, the added mobility is allowing fishermen to discover fresh territory for good Perch, Pike and Walleye action. When heading out to fish for panfish, bring small minnows, waxies (both real and fake) and “noodle” rods or rods tipped with the add-on spring tips, which are available where any ice fishing stuff is sold. When you go to these stores " ... Read >> Nik Dimich Fishing Report . 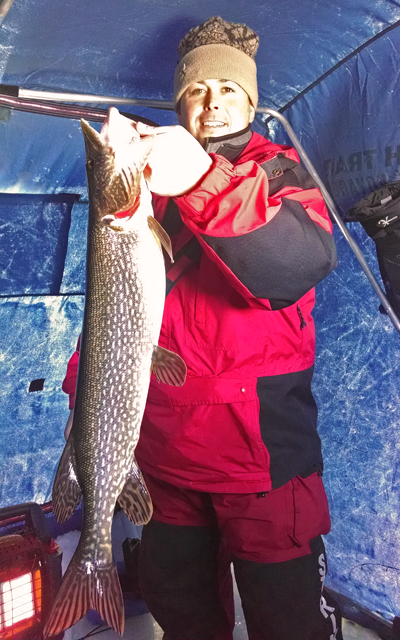 (2/10) Ryan Peterson checked in; "Ice fishing on the South end of Winnie has been reliable over the past few days. Many anglers who fish Perch are getting good numbers of fish and sorting through them to save limits." Peterson was a lot more excited about the Pike fishing though and added; "For those who like Pike, they are biting like crazy". Apparently, the Northern Pike are making an early, pre-season run toward areas where they'll be staging in preperation of the spawning season. Which by the way, is creeping up on us a lot faster than we think! With only a couple of weeks remaining in the Walleye and Pike season, traffic has been keeping his rentals jammed. In fact, his sleeper houses are sold out for the rest of this season, but there is one 4-man fishing shelter available for the upcoming weekend. If you want to jump on it, get in touch right away >> Ryan Peterson's Guiding . 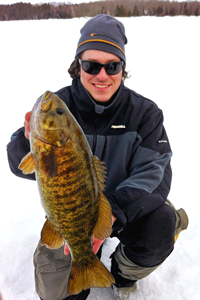 (2/10) ON Lake Winnibigosish, Grand Rapids Fishing Guide Zach Dagel added fuel to the fire. He joined a group of his friends on Sunday afternoon and reported that Perch action was steady on the Southwest side of Winnie. Dagel agreed with Peterson that most anglers are sorting in order to save "decent size fish". But, he added that virtually all of the anglers were returning to the resort, buckets filled with their limits. 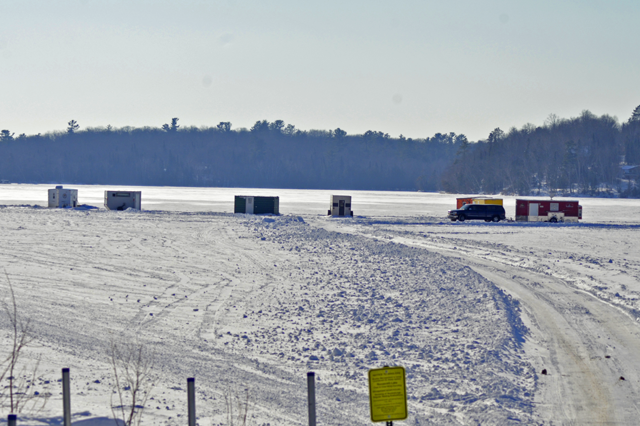 (2/10) ON Lake Winnibigosish, Confirming rumors that ice fishermen are finding their way off of the plowed roads, a spokesman for the MN DNR said yes, there are anglers using trucks and fishing in open territory. There may still be some isolated pockets of slush, so if you're heading out there, steer around snow drifts. It's also a good idea to travel in pairs, making sure that tow straps and shovels are loaded into your rigs. (2/10) Grand Rapids Are Rainbow Trout fishing action wasn't bad this weekend either. Fishing along the shoreline breaks in about 11 feet of water, Trout would show up at random intervals, I'd guess maybe every half hour or so. Using conventional "Trout Baits" like jigging spoons, tipped with Wax Worms, more than half of the fish would just roam in, take a quick look at the bait, then swim away without touching it. Maybe they've seen too many similar baits or maybe they just didn't have the right action for this day. Through trial and error, I figured out what they wanted though. When I tied on a 1/8 ounce Green Glow FooFlyer, things got a lot more interesting. Tipped with a 2 inch artificial tail, the circular motion of the bait must have been just what they wanted to see. Because from then on, all of the fish that came in actually struck at the bait. Some of them missed it, but the point is that they at least ... Read Full Story >> Grand Rapids Rainbow Trout Fishing . (2/10) From The Iron Range, Greg Clusiau; "Michael "MT" Thompson started fishing the competitive UPL (Ultitmate Panfish League) ten years ago and won his first event. Since then, he has partnered up with four different anglers to take home first place finishes. This thirst for ice fishing competition has led him to become a member of “Team USA”, where as an alternate he competed against the likes of the very best in the world, with teams from Russia and Mongolia taking part in the battle for first place. I was somewhat surprised with his answer to what his “go to” equipment is, when targeting trophy panfish. One would naturally think it would be fairly expensive, consisting of the most recent state-of-the-art gear. Not for MT. Here’s what he recommended. “For rods, I prefer HT Enterprises “ice blue” rods because they’re ... " >> Read Greg's Full Report . (2/10) On Lake of the Woods, Border View Lodge, Mike Kinsella wrote; "We have 30 plus inches of ice and extensions are mandatory. With the amount of snow we have had so far the ice should be well insulated for a long season. The anglers who are working their jigs and using electronics are definitely catching more fish. The Saugers are out numbering the Walleye and we are still seeing many Tullibee. We are still spread out in different areas fishing depths from 31 to 36 feet of water. Gold and glow red have been the hot jigs of the week. The week ahead shows temps still staying below zero but next week we are forecasted to start warming up. After this enormously long cold spell it will be appreciated. - FISH ON!" 1-800-776-3474 Border View Lodge . Ice Fishing Report February 8, 2014 Jeff Sundin - Grand Rapids Area Trout Fishing Revisited - As sometimes happens, I'm on the road early this morning. They say that the early bird gets the ... Trout, so we're off during the wee hours to find out. Don't Worry! You'll be the first to know how it turns out. OH, by the way, don't forget to swing into the Eagles Club in Grand Rapids this evening. That's right, the benefit for Dan McClure begins today at 4:30 PM and among other prizes, you could even win me! Winnibigoshish is providing good Walleye action right now. Pokegama is turning out decent Pike, there are Crappies to catch on Bowstring and the Perch bite is getting more reliable on Leech Lake's Sucker Bay. Ice Fishing Report February 7, 2014 Jeff Sundin - Grand Rapids Area Fish Shrug Off Siberian Style Cold Fronts - As tough as it can be to fish with frozen fingers and a frostbitten nose, it does have it's rewards. Ice fishermen who brave the cold are finding out the Walleye, Crappie Pike and Perch are cooperative. Maybe it's because of the reduced fishing pressure, maybe it's because of the stability of the weather pattern or maybe we're just lucky? They are active when you find 'em, but the trick now is to figure out where they are. On Thursday, our Crappie fishing trip turned out to be great in the end. But it didn't look good at first, in fact it was darn frustrating. Moving around deep water holes, Crappie location shifts as they encounter schools of minnows and swarms of developing insect larvae. The fish stay in an area until the food source dissipates and then move toward better territory. That means that just because you caught 'em here yesterday doesn't guarantee that they will be there today. It also means that just because they're not here now, doesn't mean that won't be back later. We drilled as many holes as we could, moved around as much as we could and for one reason or another, kept putting our holes in just the wrong spot. We'd spot a fish or two and we'd even get some lookers, but finding the magic spot with a big school of fish just wasn't happening. By 11:00 AM we'd resolved to the idea that it would be the evening run that was gonna save us. Now that we were prepared to tough it out for the day, I decided to allow myself some comfort. I set up my portable shelter and just before lighting the heater, I looked my Humminbird and watched the screen as it filled up with the images of fish. I dropped in my jig and long story short, a half hour later we had all of the Crappies we wanted. You decide for yourself the moral of that story. But for me, I think it means that as long as you're still in the game, you still have a chance. So whether by determination, dumb luck or just plain stubbornness, sooner or later you'll drill a hole over some fish and when you do these days, they will bite. If you're heading out this weekend, scroll down for a quick recap of the weeks reports. It will be really helpful because right now there's something for everyone. (2/7) HOW MUCH STATE LAND WILL BE SOLD FOR THE SCHOOL TRUST? That's an illusive question, but it could be more than we think. Did you know that the State of Minnesota holds land in trust for the support of public education? It's called School Trust Land and Included are roughly 46% of State forest lands, many public water accesses and much other land managed by the Minnesota DNR for public use. "The landing on the Canisteo Pit my not have looked like much, but it was well visited by lots of folks who purchased lots of stuff in the Grand Rapids area. Boats, snowmobiles, gas, food, insurance and the list goes on. All of it was taxed, all of it contributed to the local economy and all of it has to find a new place to go." A PUBLIC MEETING, co-sponsored by the Izaak Walton League and the Grand Rapids Area Library took place on Wednesday, January 29. According to IWL spokesman Dennis Anderson;"There wasn't much evidence of the "hook and bullet" crowd at this meeting." For me, that means that we have some educating to do. Beacause for fishermen and hunters, access to lakes and forests within these "School Trust Zones" may not be as secure as they think. The fact is that the Minnesota State Speaker has the responsibility of ... Read full story STATE LAND SOLD FOR SCHOOL TRUST . (2/6) Grand Rapids Area Fishing Guide, Grant Prokop wrote; "It was a fun day on the lake with the Schenkus family. Caught a lot of crappies this morning but they were tough to catch after 10. So we moved to where some perch were on the edge of a hump in 19 feet. Minnows were the ticket for the the birthday boy who caught most of our big perch! Good luck if your heading out on the water!" . (2/6) On Bowstring Lake, Erin at Geiger's Trails End Resort; "Crappie action remains steady and ice fishermen continue to report catching limits. Apparently, the Crappies really like the Grey, cloudy days or the early/late twilight periods. Access is good, with plowed roads leading to some of the best fishing spots." - Erin and Bill Charlton, Trails End Resort . (2/5) After posting a recent note about Perch fishing patterns, I received a question from Paul Fournier on the Facebook Fishing Reports Page; "Jeff, we have been catching large perch that are burping up nickel size sunnies. This has been happening for several months. A late sunnie spawn perhaps? A) Paul, I'm sure that any hatches that did occur last spring were probably late by comparison to a typical spring. Still, I think that the size of the small panfish you're finding is fairly close to the typical size of "young of the year" panfish. In the Itasca region, we have a several spots where we find small panfish in the stomach contents of the Perch we catch. In fact, the same areas consistently produce similar occurances every year. Newly hatched sunfish, crappies and Perch don't get very big during their first season. And they are prime targets for aggressive feeders like Perch. 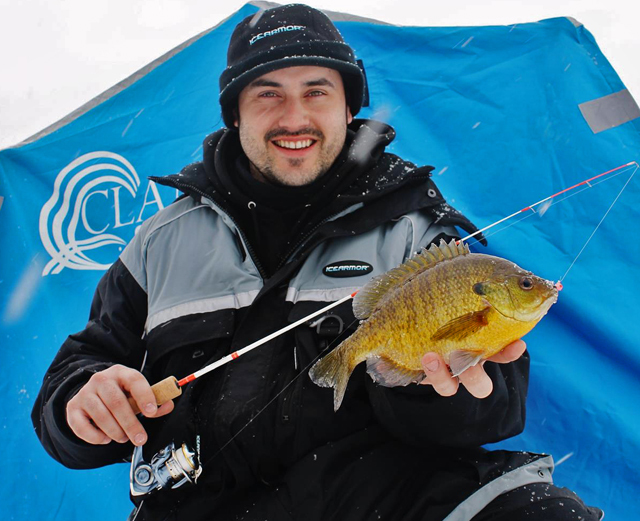 These small panfish will make their first major advance in size during the upcoming summer. Growth rates will be very fast for their first 3, maybe 4 seasons (if they live that long) and then will taper off. Ice Fishing Report February 6, 2014 Jeff Sundin - Walleye, Perch Action Heating Up On Winnibigoshish - For Lake Winnie ice fishermen, heading into the home stretch of the Minnesota Walleye fishing season is gonna be a lot of fun. Over the past few days, improved mobility on the ice has allowed anglers to venture into fresh territory. In many of these areas, Walleye, Perch and Pike haven't been pestered all winter long. So in many areas, it's like getting a do-over for the anglers who couldn't navigate onto the ice earlier this season. Mid lake humps and bars are producing fish, even during daylight hours. According to recent reports from an un-identified industry expert, the larger humps are currently the best producers. Almost every one of these larger humps has several features that would hold Walleyes. So a solid game plan would be to drill holes at a variety of key locations, then alternate between them until you spot the greatest number of fish on your electronics. Typical depths for Walleyes on these structures are 18 to 24 feet. Follow the breaklines, but focus your attention on inside turns and points. Perch may be mixed with the Walleyes at times, but they are typically located deeper, at the transition where the bar's solid bottom meets with the softer content of the deep main lake basin. Focus on locating that edge by making several small moves toward deeper water. Once you see the flattening of the water depth on the deep side, then move back toward the holes located at 29 and the first 31. That will likely be the sweet spot for Perch and you will also discover that Tulibee and Pike like this outer edge too. By the way, Perch like flats. So the same scenerario could play out as you move toward the top edges of the same structures. Aggressive Perch will sometimes be right on top of the bar chasing schools of small baitfish. Jigging spoons tipped with a minnow head are best for aggressive fish. 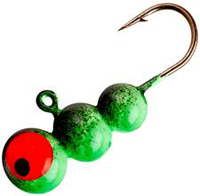 Blade baits, like a large Frosty Spoon tipped with a whole, live minnow will serve as a great "dead stick" bait to lure in the less aggressive fish. 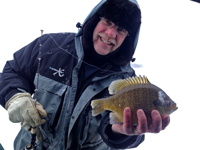 Ice Fishing Report February 4, 2014 Jeff Sundin - I Wish You Would Please KEEP BUGGING ME! I'm Perch Fishing - Whether they knew it or not at the time, Perch fishermen everywhere have seen this scenario before. The ones who KNOW are LUCKY, because we realize that it's time to get ready for some really fun times! Perch are where you find 'em and the easy place to do that is where they're feeding. More often than not, we just keep moving, drilling holes until we stumble into schools of fish as they roam the flats searching for small baitfish. But when the Jumbos wander into a good bug hatch, then they're gonna stay put for a while. 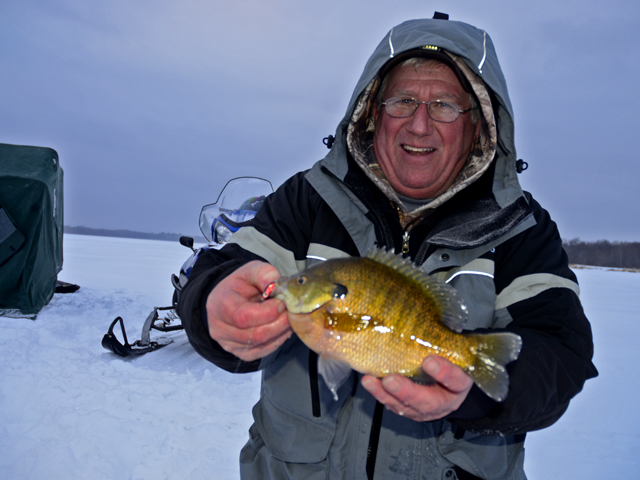 Ice fishermen who recognize the pattern can take advantage of the opportunity to produce more and larger Perch. Bloodworms, the larval form of the Midge, inhabit soft bottom areas where they feed on decaying plant matter. Mayfly Larvae, another prime food source for Perch, prefer a slightly harder bottom structure, often located nearby. It's easy to spot, because the fish usually have so many bugs in their mouths that they'll spit up several of them onto the surface of the ice. That's what we found on Sunday, early signs of a late winter, insect driven Perch bite. This time, Perch that we caught were full of the small red bloodworms. To find places like this one, think like a bug. Search until you locate areas where a soft marl bottom lies adjacent to a firmer sandy bottom bar. It doesn't have to be a major structure, the bottom content is more important than the depth change. Perch are roaming fish, so while they may be nice, sharp breaklines and other dynamic structures are typically not required. My favorite strategy is to locate mid lake bars and humps that provide a subtle depth change. On Sunday, the area where we found the bloodworms occurred along a break from 24 feet of water up to 21 feet. A soft break like this often leads from mud, to sand and that's the transition you're looking for. As we move closer to spring, the focus will be switching toward Perch fishing and as it does, we'll keep you up to speed. (2/4) Ryan Peterson checked in from Lake Winnibigoshish and said; "The road system at the South end of Lake Winnibigoshish continues to improve. The good news is that fishing action has been heating up on the big lake too. On Monday, Ice fishermen reported good catches of Walleye, with some Perch mixed in. We've also had some good Pike action lately and with a stabilizing weather trend, we expect to see even more improvements.". Good luck and be safe! - Ryan Peterson's Guiding . 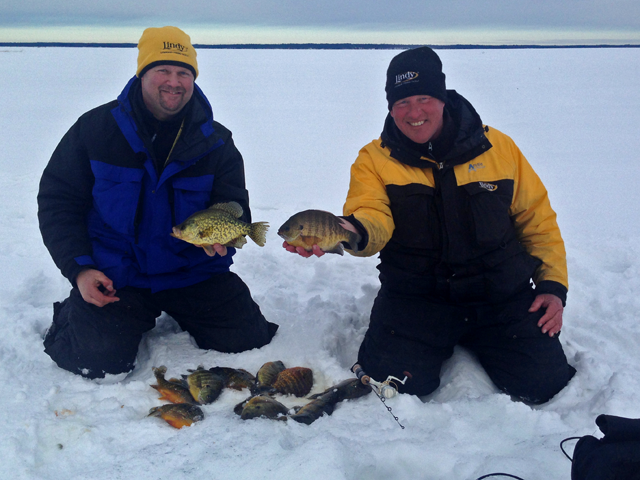 (2/4) Leech Lake; "Perch fishing remains steady on the flats at the South end of Sucker Bay. The road system at pine Point provides good access to the lake and anglers with 4 wheel drive trucks can travel off road as well. Perch are scattered and the sizes are mixed, but fish in the 10 to 12 inch range are coming in reliably. (2/4) Just for fun, Carl Bergquist hopes to warm you up with a fishing report from Southwest Florida's Sanibel area. He's been out on the water with Captain FlyRod, Mike Rehr and they caught some nice Redfish. Carl Said; "The neat way about how Mike rigs a shrimp is that you can cast it out and retrieve it like an artificial lure but it's actually a live bait. Then when you spot a fish in the clear water, you can sight cast directly to it. It's a lot like hunting, spotting your target, stalking it, then lead, follow and shoot. It's a lot of fun. I ended up landing three beautiful redfish between 26" and 28". The first redfish: Mike spotted a fish flash its side about 60' from the boat. He had me cast over to it and I guess I cast right on top of the fish and ... click to Read Full Story >> Fishing Sanibel Redfish with Capt. Mike Rehr . 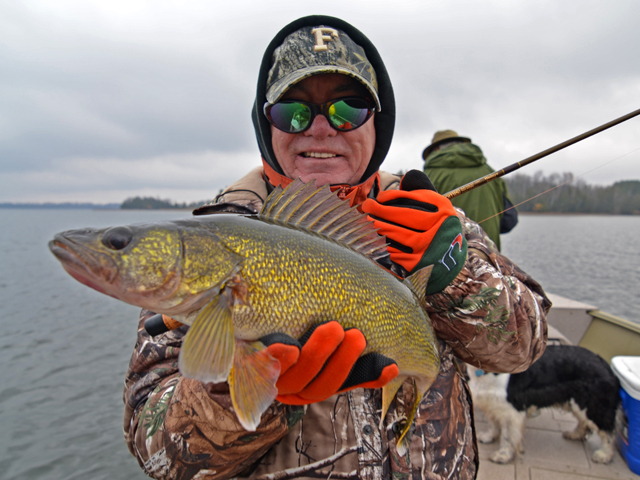 (2/3) Leech Lake Area Lakes, Gary Roerick Says; "Walleye Success, Ya gotta Like it! - Most customers and fishing friends had a good weekend of ‘eye catching. I was impressed to hear from most fishermen that they released a variety of fish in the 23” to 26” category and they were able to take some nice 13” to 17” ‘eyes home for dinner. Despite the time of the year that usually is a tough catch, fishermen were persistent and caught fish. The deeper underwater humps in the 33’ to 41’ range did good for the 1st of February! I don’t believe that I have seen this much ice on Walker Bay for years. It is now time to dig out the extension for my auger. I had only 1” to spare between my auger handles and the floor of the fish house when drilling new holes inside my sleeper houses. The tape measure says that it is in the 27” to 29” range out in the middle of Walker Bay of Leech Lake. Some of the other area lakes that I fish on now have ice over 30” thick. Presentation of bait can be a critical factor when the fish are slower and more lethargic. Try using smaller hooks, smaller minnows or portions of smaller minnows. I would also suggest using hooks that glow or even rattle. Slow down the presentation or maybe just dead stick the bait. I was in two different houses this past weekend and sharing with customers some ideas on how they might be able to get the fish to bite, since many of the people are reporting they are seeing lots of walleyes down by their bait, they just can’t get them to bite. Two different houses caught a walleye while I was in their house discussing techniques. Now if I could just sell that ocean front property, eh! Rattle wheels with small fatheads did good on a variety of locations, even during daylight hours. Give me a call at 218-760-8266 if you would like to get involved with some last minute fish catching as the countdown is less than 3 weeks of game fish activity. Check out my website at http://roericks.webs.com to learn more about our business or to see the latest catches by some of our successful clients! Now is a good time to start thinking about that favorite eelpout fishing destination. I understand that it is all about habitat, you need to study their habitat features and then move your fishing shelter to one of your best kept secrets. The contest starts two weeks from this coming Thursday on February 20th. It’s a good time to finalize your plans to come and join in the fun at our 35th Annual International Eelpout Festival on February 20th to 23rd in beautiful downtown Walker Minnesota!" - Gary Roerick Roerick Fish House Rentals 218-224-2836 . (2/3) From The Iron Range, Greg Clusiau; "Bowstring offers plenty of places to fish, which is always nice, especially if your spot isn’t producing, which happened to Blake and I on Saturday. After spending two hours trying our luck in a good “community hole”, yes, the road goes there, we reeled up and relocated to the other end of the road system. It turned out to be a good call, as the first hole we drilled was filled with fish. Our limit of ten each was achieved in fifteen minutes and we were back home in Keewatin, 65 miles away, a little after noon. Now that’s good fishing. On Sunday, I headed to the same area that I ended with on the day before and it was as if I had never left. The fish were there and eager to bite. The best bait for me was" >> Read Greg's Full Report . (2/3) On Lake of the Woods, Border View Lodge, Mike Kinsella wrote; "Who is right? The Ground Hog or the weather guy who asked; how is it possible he saw his shadow when it has been overcast and raining? We have located houses in different locations this past week and still have mixed reports of the fishing. The Saugers are out numbering the Walleye and we are still seeing many Tulibee. Again the week ahead shows we should get above zero a couple of days but will mostly stay below zero for the week ahead. FISH ON!" 1-800-776-3474 Border View Lodge . (2/3) Lund Boats Announces NEW Big Water “Magnum” - Fully loaded 2075 Tyee Magnum takes Great Lakes trolling to new levels. Powerful yet athletic and loaded with features and abundant space, Lund’s 2075 Tyee Magnum redefines the notion of a big water fishing boat. >> Learn More about the Lund Tyee 2075 Magnum . Ice Fishing Report February 2, 2014 Jeff Sundin - Well, That Was Fun - At least it was is If you like the idea of finding out about places not to fish! Saturday was just one of those days. I and my fishing partner, Zach Dagel knew that we'd need to find some fresh territory. Everybody we know was already headed for the same spot on the same lake and since we'd already been there, we just weren't gonna learn anything new by joining the crowd. So, we avoided the crowd and learned something new alright. We learned about two Itasca area lakes that are currently providing plenty of opportunity for a nice, quiet, chat. But not much else. That's okay though, we're still smiling. Everybody gets a good skunking once in a while and at least now we got ours behind us. I hope. For us, it's back to the drawing board this morning and again, we're gonna venture off into some new territory. Hopefully this time, we'll have a little better luck. But YOU KNOW that either way, you'll be the first to read about it, right here. (2/2) Leech Lake Ice Fishing Report - An email from Tait Grabow with a Sucker Bay Perch fishing report; "They are plowing (roads) out to Goose Island. But blowing in of the roads has been a problem lately because of snow and high winds. To travel off of the main roads, you need to pick your exit to avoid areas with high drifts. Perch fishing has been decent, with sorting and moving to stay on fish. But that is Perch fishing as I know it anyway". On Saturday, Grabow's crew struck a dud on their first spot, but moved to another area and managed to capture 30 keeper size Perch. I asked if the crew encountered anything special in terms of size, he replied; " Caught four 12 inchers, with most fish in the nine to eleven inch range. (2/2) On Lake Winnibigoshish, Pat Rooney at Denny's Resort dropped a quick note; "We now have roads out to Big Musky and the Island. There's one small narrow spot near little island to travel all around the road area. The big island has some deeper snow, but manageable. We also have a road up the east side to the first under water point, seems as there is a live crack at that spot running north west to just north of the big island between big and little musky. Nothing less then 16 inches of ice though. That ice is also the best looking clear ice. 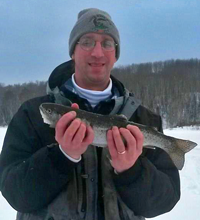 (2/2) Nathaniel Shore authored a piece for Ice Fishermen who dream about catching a lunker Lake Trout through the ice. Shore says; "When not spawning, lake trout just hunt and eat. It’s all they can afford to do if they want to maintain such outlandish size in such sterile environments. That makes our jobs easier: Get something in front of a laker and it’s likely to eat it. Since lake trout use the entire water column from right under the ice to the bottom in depths ranging from 5 feet down to about 150 feet, good sonar is a must. If a solid mark appears anywhere in the water column, immediately drop or raise the lure to that level before it swims off. If you can’t see big marks on sonar, methodically fish the entire water column. Drop the lure 10 feet down, work it for a minute or so, drop it another 10 feet and ... read full article >> Find and Catch Lakers Under Ice . (2/2) Cass Lake Winter Challenge Ice Fishing Contest - Scheduled for February 8, 2014, the Winter Challenge allows ice fishermen to compete for both large fish awards and raffle prizes too. The contest is a fast action event that begins at Noon and ends at 3:00 PM on February 8, 2014. (2/1) From The Iron Range, Greg Clusiau; Yes, cold weather does have it's advantages and whenever there's enough cold weather, the abundance of extra ice provides anglers with additional ice fishing opportunities. When this happens, one place that's to visit is Lake Superior's Chequamegon Bay and Apostle Islands. Fishing for Trout is what drives most of the traffic onto the big lake and this week, Greg picked up some pointers about where to fish it from fishing guide, John Marksman. Marksman says; "The Chequamegon Bay and Apostle Islands area is big water. (But) don’t be intimidated by it. Instead, learn it one small piece at a time and put a plan into place. Using your electronics and gps lake map, check the contours for any debris on the bottom (logs, stumps, trees, big rocks, and rock piles). Other good places to check over are old docks, near shore rock piles, that may extend out into the lake along with shallow bays, big and small ... " click and >> Read Greg's Full Report . 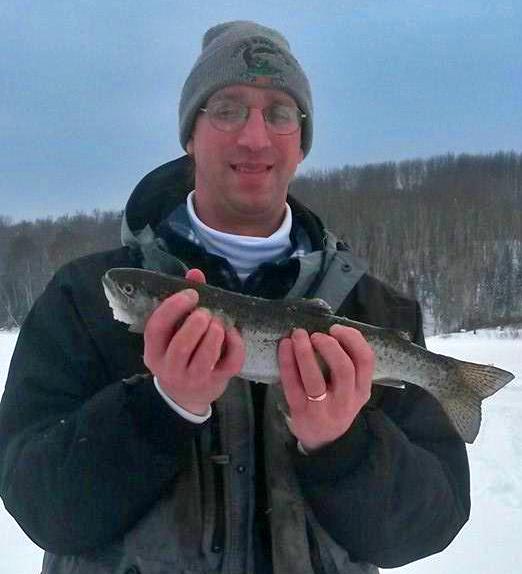 Ice Fishing Report February 1, 2014 Jeff Sundin - Welcome to February. New and Improved With Added Brightness! - Among life's simplest pleasures is knowing how to appreciate Every Single Minute of every day. I do the best that I can, but January, that was getting a little old, even for me. Waking up to February helps make life easier because this is the month when added sunlight makes each day noticeably longer. In fact, on this day alone we'll enjoy 54 minutes and 20 seconds more daylight than we did on January 1st! YES! That's almost a full hour and just think how much multi-tasking you can fit into that space! The arrival of February also means that I'm only 60 days away from dropping my boat into the water. So I guess we better start talking about the upcoming open water season fairly soon. But first, there's still a little more time to enjoy ice fishing. Ice conditions in the Itasca are continue to improve and on most of our Northern Minnesota lakes, transportation has become a lot less problematic this week. Anglers using pickup trucks and wheel houses are quickly replacing snowmobiles and track machines. At this point, anglers who wish to drive on the ice, can find a plowed road to access most of the larger lakes. User developed roads are cropping up on many small lakes too and while these tend to go UN-noticed by most of us, an adventurer with an afternoon to kill, will be able to locate several lakes with road access. Of course, we still do have fantastic snow conditions too and if you want to travel by snowmobile, you can go almost anyplace you want. January's temperatures may have been cold, but they were stable and that has meant that there are very few ice ridges to contend with. There are some small cracks popping up on a variety of lakes, but until we start seeing some more dramatic swings in temperature, the lack of pressure cracks will be an added bonus for ice travelers. (2/1) “Success with Side Imaging” - Powerful new video trains anglers to harness the power of fish-finding technology . Eau Claire, WI (January 17, 2014) – Modern recreational anglers are blessed with abundant electronic resources for locating and catching fish, including high-resolution sonar, GPS chartplotters, hyper-accurate digital depth maps, integrated boat control systems, and underwater cameras…whew. However, many of the advantages provided by these tools remain untapped, as many anglers are unwilling to divert their limited fishing time into learning the intricacies of fishing technology. But a new educational video series seeks to overcome this barrier by demonstrating how modern technology can be successfully applied to real, multi-species fishing situations. click to read full article >> Success with Side Imaging . (2/1) Should I Stay Or Should I Go? - By Nathaniel Myson with Jon Thelen and Jeff Sundin . If you’re an ice-fisherman, you’ve almost certainly debated this question: Sit tight and wait for the fish to come to you or pick up and start drilling holes to go to the fish? Staying put may result in a day spent just out of the fish’s range. Go mobile and you might leave just before the fish arrive. If this indecision is bugging you, here are a couple guys who know a thing about staying or going, and their advice can help you make better fishing decisions on the ice. Each approach offers advantages and disadvantages, and each situation is different, so there is no set answer that fits every fishing occasion. Lindy pro staffers and ice-fishing experts Jeff Sundin and Jon Thelen spend quite a few days using both approaches, and experience taught them the factors to consider. With that in mind, we asked Sundin about the situations that call for a ... >> Read Full Ice Fishing Article . Photo courtesy Gus' Place Resort: For the brave hearts who went through winter storm Seneca out on the lake, there were a few pay offs, like this beautiful Pike on the last day of the season. Hey BooBoo, we'll just ride the storm out here in the fish house. Then we can just drive out in the morning! Warm weather, improved mobility and a mixed bag of panfish turned out to be a great "Plan B" for Wednesday. As we head toward spring, Sunfish, Perch and Crappie will show up in shallow water. Crappies are located in deep water, but for us, the deep water needs to lie adjacent to structure. Drilling along the edges of large deep water flats turned out to be a much better strategy than drilling random holes over deep water. Dan Johnson caught up with me while he was working on an article about fishing for late winter Bluegills. The tips in this article will help you catch more fish right now, this week. Click to learn more about >> Dan Johnson ACOM and >> Outdoor News . Photos courtesy Bill and Karrie Treichel: "What a nice way to end my time off. Icing my first trout ever! There probably are very few things as yummy as fresh-caught trout. We're about to find out, absolutely can not wait for dinner tonight! 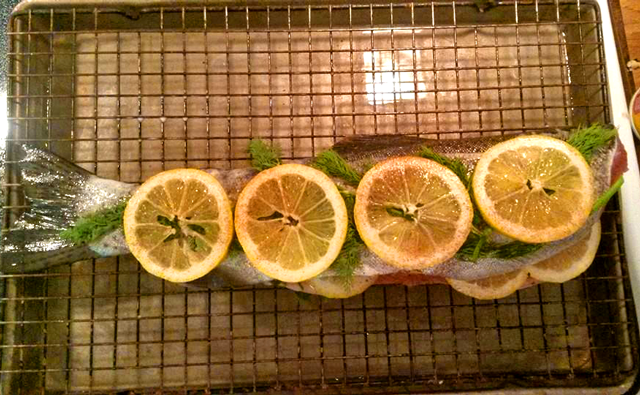 Get the recipe and read Bill's comments about >> ice fishing for Rainbow Trout . Like Arne said; Once they move in, "You gotta catch as many as you can before they leave and then wait for a new batch to move in". For me, there was mix of Perch, Red Ear Sunfish and Bluegills. They all had a sweet tooth for the Glow Red Frostee Jigging Spoon tipped with a couple of Wax Worms. For Bill Powell, the mixed bag included some dandy Crappies along with Perch and Bluegills. The shallow water fish came in every size ranging from really small to really big. But when Arne Danielson drops his jig in the water, the bigs ones tend to come running. Crappies and ice fishing go hand in hand. Outdoor Writer Jeff Samsel says: "It's a good thing we don't have colder weather closer to Clarksville, GA, I'm afraid that I'd spend more time than I should on the ice". We only had a couple of hours of fishing time, but that was plenty. There aren't many days that I start at my home in North Georgia and finish on the ice, catching fish. Read Story >> Jeff Samsel My Sort of Travel Day . 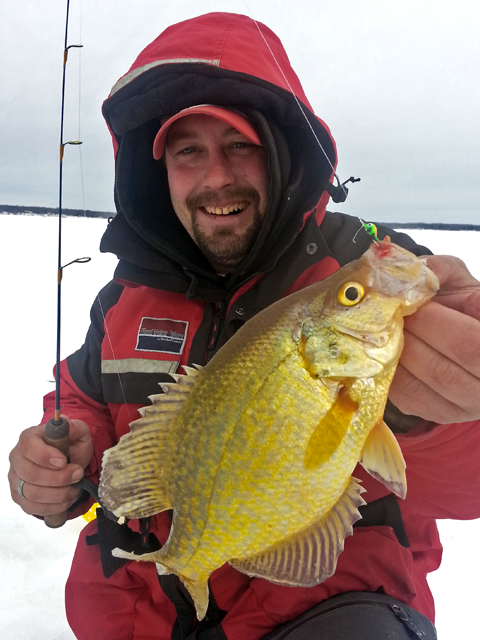 "No corks or spring bobbers for me", said Michael Thompson as he sets the hooks on another nice panfish. A line watcher, MT sets the hook whenever he sees it straighten out or go limp. >> Read Greg Clusiau's Story >> Fishing With Michael Thompson . Photos Zach Dagel: A Rainbow Trout swings in for a look. Using conventional "Trout Baits" like jigging spoons, tipped with Wax Worms, more than half of the fish would just roam in, take a quick look at the bait without striking, then swim away. When I tied on a 1/8 ounce Green Glow FooFlyer, things got a lot more interesting. Tipped with a 2 inch artificial tail, the circular motion of the bait was just what they wanted to see. Read Full Story >> Grand Rapids Trout Fishing . When the Jumbos wander into a good bug hatch, then they're gonna stay put for a while. 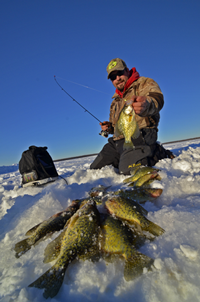 Ice fishermen who recognize the pattern can take advantage of the opportunity to produce more and larger Perch. Ice Fishermen who dream about catching a lunker Lake Trout through the ice, can get some tips from this article. Read >> Nathan Shore's Find and Catch Lakers Under Ice . On most of our Northern Minnesota lakes, transportation has become a lot less problematic this week. Anglers using pickup trucks and wheel houses have replaces snowbiles and track machines. Using two trucks equipped with full gas tanks and plenty of tow straps Zach was confident that we could move around the lake. Using the road out of Trails End Resort as a starting point, we traveled it to the end and then busted some snow drifts to head across the ice into fresh territory. We spotted a small inside corner along the edge where deep water met a shallower, soft bottom flat. The depth ranged from 20 to 28 feet. The shallowest and the deepest holes produced no fish. But the holes that ranged in depth from 23 to 25 feet did. A walleye “double” warms a cold, cold, really cold (and windy) fishing day for Justin Harms and Nik Dimich…and a heated wheelhouse doesn’t hurt either. Read >> Nik Dimich fishing report . Photo Jeff Sundin, Sept 2013: Ya' can't catch 'em if they're not in there! Read the article "Quest For Quality Pike" and find out what we can do about it. On Pokegama, walleye fishing has been a hit and miss proposition, with evenings and early morning more productive than the others. But drop your bait in the water and give it a whirl, because you never know what the next bite is gonna be! Read Full Report . Sit tight and wait for the fish to come to you or pick up and start drilling holes to go to the fish? If this indecision is bugging you, here are a couple guys who know a thing about staying or going, and their advice can help you make better fishing decisions on the ice. 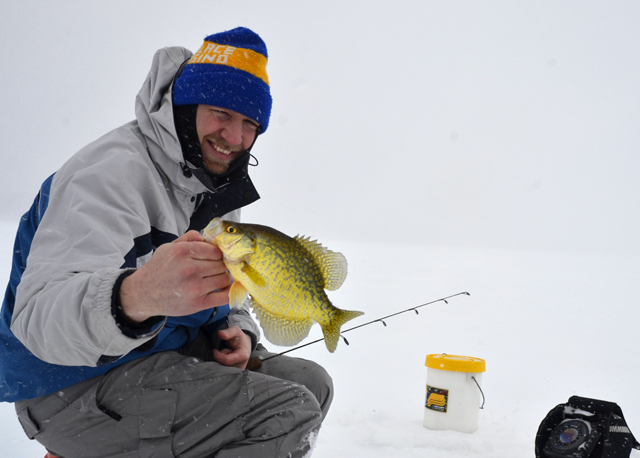 Read Article >> Ice Fishing, Should I Stay or Should I Go? For me, messing around with live bait on the ice can wait until the fish are less aggressive. During a "Hot Bite", I switch to artificial combinations like the Foo Flyer and Ice Whatsit Tail. >> click to Learn More Foo Flyer <> Ice Whatsit . Photo Circa Fall 2012: Sanibel's Captain FlyRod, Mike Rehr occasionally visits Northern Minnesota during our open water season. It's a long way to travel for a hug, but the therapy really pays off! Photo Mike Rehr, Capt. FlyRod: If I ever do get a vacation, then a trip with Captain FlyRod will be high on my priorities list. When I come, I'll bring both the Abacus and the Slide Rules. That will give us a fighting chance at keeping track of all the fish we're gonna catch on that shallow flat. Photo Trails End Resort: Mark Thompson found his way to the Crappie hole and found good action. Most were caught while fishing in 23 to 24 feet of water, using small jigs tipped with Wax Worms.